Homeowners know when they're cold and they know where they’re cold. Recent research shows that bathrooms are often the coldest rooms in the house and most often people just live with it. The research also explains that because bathrooms are where we start and end our day, they serve as the most important rooms of the house. Wait what?! The most vital room of the house is also the coldest? Now, that’s a bummer! As Energy Blogs puts it, “If you turn up the heat to warm the room, the rest of the house gets too warm. Shut all the heating registers except the bathroom and it puts too much back pressure on the furnace.” Dealing with a cold bathroom – or any other cold room of the house – is frustrating. What most of us really look forward to is waking up every morning and stepping into a warm, cozy bathroom rather than a cold one to start off the day. With WarmlyYours offering a diverse portfolio of bathroom luxury items such as in-floor heating, towel warmers, radiant panels, shower mats and mirror defoggers, it comes as no surprise that bathrooms have become the most popular rooms for radiant heating products. 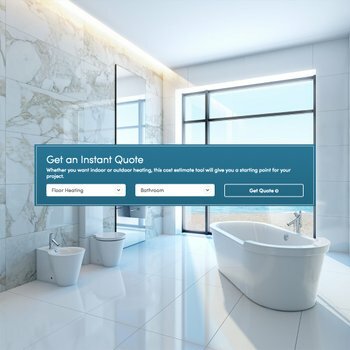 WarmlyYours' third quarter results reflected that consumers most often chose floor heating for bathrooms, accounting for more than 50 percent of the business; surpassing kitchens, living rooms and powder rooms. Research suggests that people are choosing radiant heating for bathrooms over any other room because bathrooms are where people intermittently decompress and find relaxation while taking a hot bath or while making themselves presentable in front of a mirror. Furthermore, because radiant floor heating doesn't come out of a vent or baseboard, it allows for more flexibility in placing furniture around the bathroom – and that’s a definite organizational advantage! People also like the idea of the heat being evenly distributed throughout the room for an overall warmth and increased comfort level. 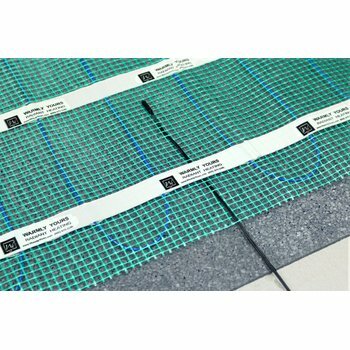 Another factor people really take into consideration is that WarmlyYours’ electric radiant heating can be installed under any type of floor surfaces such as wood, tile, stone or marble. Meaning, homeowners can have their choice of favorite flooring while still experiencing the luxury of heated floors. They say if there's one room that deserves a little extra luxury, it's the bathroom. For that reason, homeowners are also addingtowel warmers to their bathrooms, an affordable extravagance that allows them to wrap a fluffy, warm towel or a cozy bathrobe around them after they are finished with a hot bath or shower. WarmlyYours' towel warmers are made with superior hand-finished quality metals in several different models to match any bathroom design or style. With these affordable radiant luxury items in place, homeowners get a chance to add a glamorous sparkle to the bathroom that complements the house and improves their lifestyle. Implementing luxury and comfort in the bathroom never goes out of style! Imagine never having to take that icy step out of the shower or tub again. Heated floors can fulfill that potential. What are you waiting for? Visit our website today or give us a call at (800) 875-5285 to find out more about in-floor radiant heating or any of our bathroom luxury items. Your bathroom is awaiting the special treatment it will get with radiant heating.